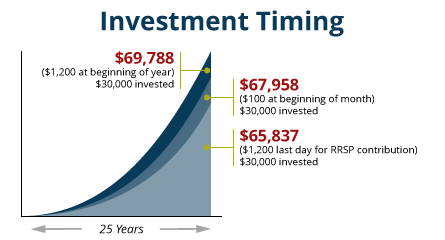 To reap the most benefit from your investments, you need to start saving early. Because the longer your savings stay invested, the more you gain through the power of compound interest. The magic of compounding is that you earn interest not just on your contributions, but also on all of the accumulating interest, dividends and capital gains. This causes your money to grow faster and faster as the years go by. Don’t delay. The earlier in life you start investing, the more time your savings have to grow. Contribute early. By making your investment in January of the current tax year, instead of at the last moment of the next tax year (at the end of RRSP season in late February or early March), you’ll have an extra 14 months of compounding working to your advantage. Make regular monthly contributions. If you can’t make a lump-sum contribution early in the current tax year, you can still benefit by making monthly contributions. The following example illustrates how much your RRSP can earn when you make your total annual contribution at the beginning of the year, at the end of the year and through equal monthly contributions. Mark, Sean and Richard each contribute $1,200 annually to their RRSPs earning a 6% average annual compounded return. Mark contributes his $1,200 at the beginning of each year. Sean contributes $100 at the beginning of each month throughout the year. Richard contributes $1,200 each year on the very last day for RRSP contributions deductible in the tax year. Mark's RRSP has grown the most to $69,788. Sean's has grown to $67,958. Richard's has grown the least to $65,837. The Value of Advice Reviewing your Retirement Plans? We encourage you to talk to us. Click here, if you would like to discuss your financial plan or to receive information by mail.